Build vs. Buy: Why Build? Today consumers have an unprecedented amount of generic software available to handle virtually any situation. If you're in business, you've probably at one time asked yourself "why don't I simply buy the shrink-wrapped product off the shelf and use that?" The truth is that a lot of people do, and it's mostly because a lot of people don't know that they have a choice. Throughout the many years of our experience, we have seen the same story play out again and again: a slick salesman promises a company that their product can do everything (including slicing bread) and that their product is "totally customizable" for the company's needs. After producing impressive client lists, most companies are sold and quickly discover that the they now have to adapt their business to fit how the software works. In many cases, the time it takes to get large purchased systems up and running as well as adapting the company's practices to work with the software takes as long, or longer as it would have to write a brand new custom system from scratch. Often companies end up hiring other software development companies to develop complicated peripheral systems to make up for the deficiencies of the purchased product. To top it all off, most large purchased products have price tags in the hundreds of thousands or millions of dollars. When bugs are found or new features are required, companies will often have to wait for months (or years) for the software producer to release updates or patches. Eventually, everything works, but not before the company has lost valuable time and money in making it work. The existence of thousands of "standards", "best practices", and "management techniques" only proves that there isn't one right way to do everything, and there isn't one magical piece of software that will do everything for everybody. Everyone, including you, does business differently and in the way that best works for them. Your software should perform in a way that best works for you. You've either arrived at this page to find out about your options, or maybe it's because you've bought that shrink-wrapped product and discovered it wasn't quite the solution the packaging promised it would be. 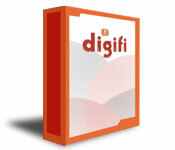 With digifi you aren't buying a piece of software that anyone else can walk into a computer store and buy; you are buying your software. We will sit down with you and find out exactly how you do business. We will use our business analysis experience to suggest ways that the software can increase your productivity specific to your needs. Throughout the development process you'll be given demos and progress updates to ensure that our end result is your end result. From simple one-window applications, to massive enterprise resource management systems, digifi can provide the right fit for your size and budget. We go the extra mile to ensure that your user experience is painless and fun. Please check out our portfolio for samples of our work. If you like what you see please contact us. Our contact information is at the top and bottom of the page. Is there a program that does X? If there is, we'll help you find it. If there isn't, or if the stuff that exists doesn't meet your needs, we can build it. I already have a software system running at my business. Can you work with it? What the heck is software, anyway? Software is a generic term for any information designed to tell a computer how to do something without being physically built into the computer. For example, your monitor, keyboard, and CD-ROM are all "hardware" (because it exists physically). Software are computer programs like Microsoft Word, Linux, Microsoft Windows, computer games, your web browser, etc. Simply put, it's the stuff that makes the computer do all the fancy things it does, and it's something we're quite good at.